Its been a while since I have been asked to contribute to an interview or primer and I have a lot of respect for guys who run the smaller conventions and shows that form the backbone of many wargaming clubs. Plus I know for a fact that a good dozen or more IonFans (our name for our customers) are attending Planetfall. Ask your questions and the knowledge shall be imparted upon you! Q: Patrol Angis looks like a fascinating rules system. 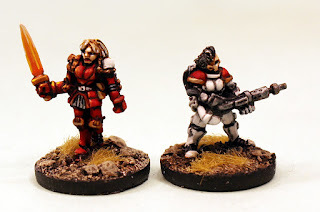 Can you tell me what makes your game system different from other 15mm titles on the market? A: One of the things I love most about wargaming is its diversity and choice in rule systems and settings. Every wargamer I know, myself included, owns many different books and treasures them all. So I was well aware that Patrol Angis would go out into a world with a lot of competing titles including some others I had already written myself! What makes it different is in two main areas. The rule mechanics and the setting. I will talk about the mechanics first. 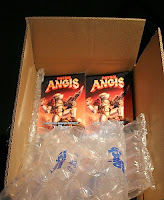 Patrol Angis is the first of a series of titles in The Ion Age and its the core book. This means its a starting point and its skirmish wargaming in the far future. Skirmish wargaming with one platoon a side (but you can have more) with full rules for infantry, bikes and battlesuits. Its tactical and small level. The rules are easy to learn and are centred around the D8 (eight sided dice) with a couple of features special to this system the 'Activation Token' and the 'Troop Element'. Activation Tokens are taken from the Initiative roll that is made once per turn by each platoon in play with the highest roll winning and determine the number of tokens for the turn for each platoon meaning every turn can vary in length and choices must be made. Players love this feature as a Troop Element needs a token to act in the turn. 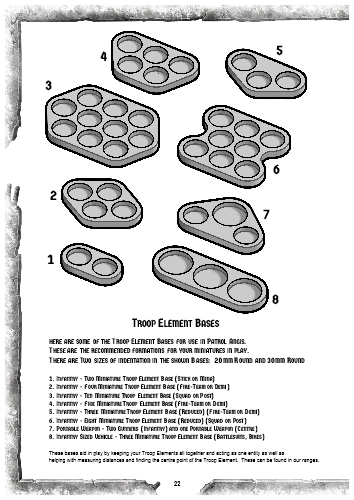 Troop Element are what your platoon is made up of and you can choose the size of these! Squads of ten, Fire-Teams of four, Sticks of two making up your platoon. This is very flexible and you choose how your Troop Elements are composed! As well as these two aspects there are the 'Courses of Action' which are the choices a Troop Element has when its activated and it covers things such as Movement, Firing, Close Combat, Re-Motivate (part of the morale rules) as well as Dash and other more specialised choices. This gives a lot of variety in play. There are 'Advanced Rules' which add customisation to your miniatures in play with special abilities, skills and equipment opening up options for your Retained Knights and Muster. 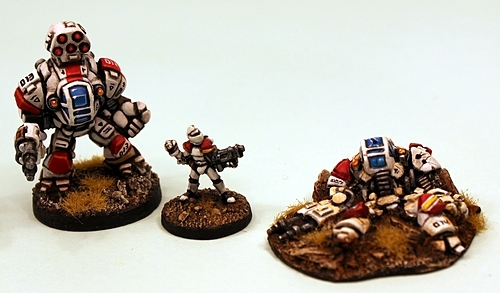 Lastly the 'Platoon Creation Rules' give a massive level of choice in assembling your miniatures into a force in play. There are full rules and statistics tables in the book. As the first title in our series Patrol Angis is the 'light bulb' in an otherwise dark room. Its a window into The Ion Age and its universe. The setting is during the Prydian Civil War so its a war that pits brother against brother and former allies as enemies. An embattled Prydian Army tries to hold 'The Precinct' together as rogue Marcher Barons and their armies as well as the Leagues of Canlaster and Yordan try to grab worlds for themselves. All of this over the vacant Throne of the Addans on New Glastonbury. Space Opera that is imaginative but solid. Retained Knights wearing powered armour align themselves to a lord and carry his or her banner. Its a universe much of my own design and it borrows from the real world in some ways. I have always adored the War of the Roses and a I am sucker for the Arthurian Myths too. I have a tale to tell and as time passes it will become deeper and more glorious. 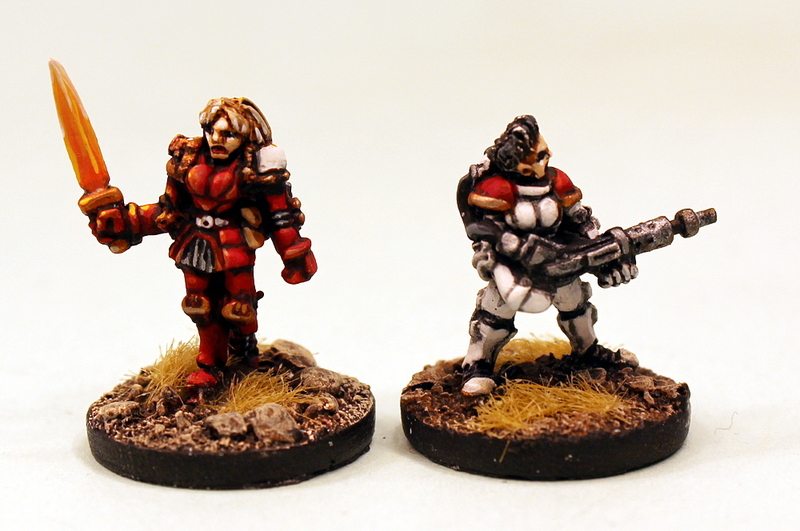 People have come to The Ion Age for the miniatures, they enjoy the rules, but some tell me they stay for the story. When you take these features of the rules and of the setting together you get something rather different to anything else out there on the market. Read an independent review of the rules on Conflict Cornucopia blog HERE. If you want to download a free folder of files for the game you can do that HERE. Q: What is the level of unit customisation in your game? 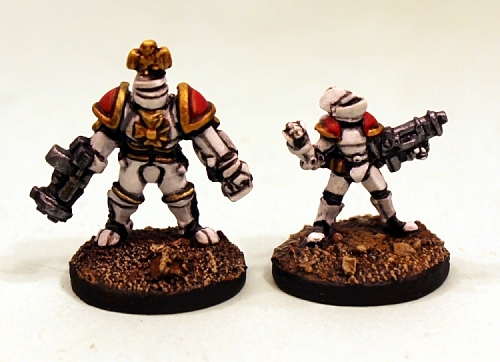 Are units presented as written (such as in Warhammer 40K) or completely customisable (like Gruntz). Where does Patrol Angis sit here? A: I would say on that scale that its as open as a set universe will allow. What I mean is that all the platoons, lances, formations in Patrol Angis must be set in The Ion Age but within that its very open. You can choose the structure of your platoon, you can choose its members weapons and skills. I did this on purpose as it reflects the fact that every Marcher Baron organises his Muster and Retained Knights differently. So its not generic but its very open. Q: How steep is the learning curve for Patrol Angis? A: Patrol Angis is not a complex wargame to learn. It was extensively play tested by a public group (you can see the results of this on The Ion Age blog searching tag Patrol Angis in 2013) whose experience level ranged from not very much to veteran. The rules can be absorbed really in the first game and the advanced rules in maybe three games. So three hours of play all in. I would call this a shallow curve. I don't create or want to play complex games that give me a headache. Wargaming is a hobby that should be fun for those playing and heck if its space opera sci-fi it should be awesome fun! Q: What is the average footprint of the game meaning how much space do you need to play? A: As this is a 15mm scale wargame you do not need a lot of space in which to play. I put a lot of thought into the lay out of tables and of the 'footprint' and to that end the Patrol Angis rules have a whole page on this subject with an explanatory image as well. The game uses 30cm squares to assemble a playing area and a small game can be played in 60cm by 60cm and a normal sized game in 120cm by 120cm so your normal sized wargaming surface will do just fine. Q: In relation to the last question how long do you think that average game of Patrol Angis would last? A: One Hour. Patrol Angis is a title in the 'One Hour' series in which we have aimed to have a typical game last sixty minutes. Now that is tuned to novice players so if you are more familiar and experienced with the rules it would be less. Its a fun and fast tactical game. Personally I now play one platoon a side in about thirty minutes and an hour for two platoons a side and three or four players. The solo play rules do not slow play all that much at all and some people have told me that against their normal human opponent they are actually faster! 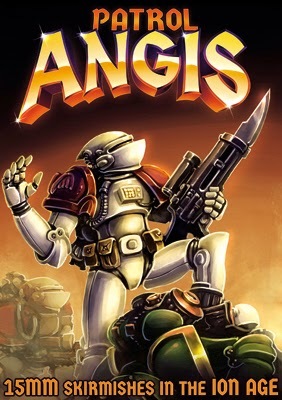 Q: What would you recommend as a well balanced force for a new player of Patrol Angis? A: There is a full points system in the book and this allows for the creation and tailor fitting of forces (platoons and lances) of Muster, Retained and Desteria as well as mixing in Portable Weapons, Bikes and Battlesuits. Players can balance up a force in this manner and a lot depends on the advanced rules, skills and so on the player chooses. 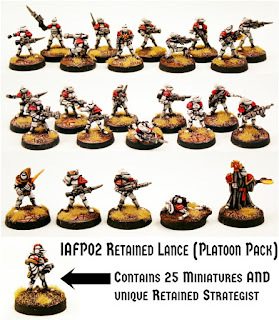 We have core forces called 'Platoon Packs' which give a wargamer a whole force to begin with and each of these contains a whole force including a bonus unique free extra miniature only in that code. Excellent! 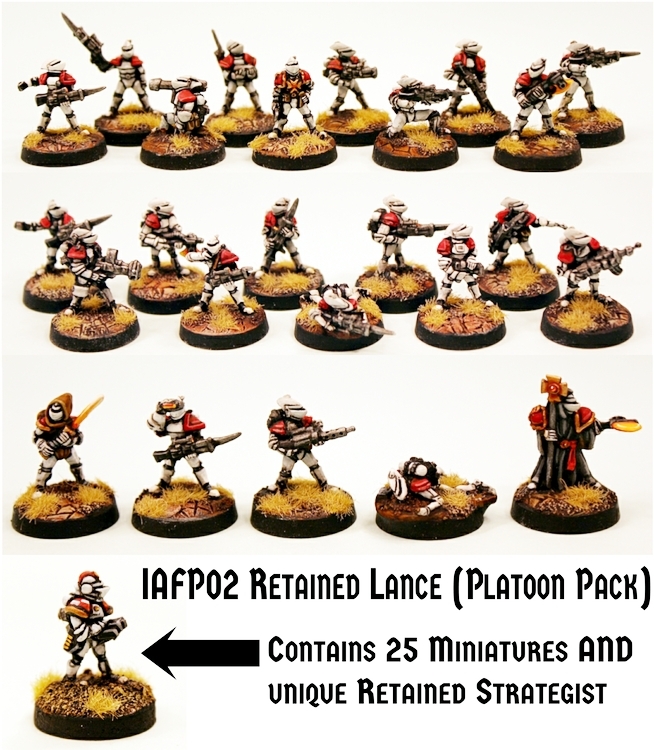 We will have more but currently we have IAFP02 Retained Lance and IAFP04 Muster Platoon as well has IAFP07 Planetary Militia Platoon and others. You can really take any normal code and use it as we provide miniatures in tens, fives, twos depending on type in play. Lastly we do have a game pack for Patrol Angis which contains the book along with two entire diverse platoons and a unique miniature for free as well. Wargamers have told me directly that the game pack is great for getting into the game and its pretty balanced too containing infantry as well as portable weapon and battlesuits. There are also three scenarios in the book using these forces. Really one of the greatest things about Patrol Angis is that you get yourself twenty two miniatures and then assemble a force with them. Q: Could you give a very brief description of game play of Patrol Angis for me? A: I can do better than that! Conflict Cornucopia blog published an independent AAR (After Action Report) which goes through a scenario in the book turn by turn along with pictures. This explains the game and how it works. You can visit the original post HERE or go HERE on our blog to download it as a PDF as it is quite a read. Q: Is there a standard points cost for competitive play in Patrol Angis? Or is the game purely scenario driven? A: To answer that I have to turn to other titles I have written over the last decade plus. Tournament and competitive play is excellent and I encourage it as ultimately our hobby is a social one when people get together and compete. However I have found that this takes a different form depending upon where in the world and when wargamers are playing. To that end I typically do not put additional mechanics in a book concerning this. Flintloque is played all over the globe and has been for near twenty years through different editions but it has no mechanics for this and instead alongside a points system it plays in scenario form as that suits its humour and style. USEME is purely points driven and has no narrative and its excellent for tournament play. Patrol Angis contains a full points system and while its ultimately a narrative or scenario driven game system (we love tales of high adventure!) there is a listing for points values for a quick game and this serves also for building forces for competitive play. 1800 Points for a Force. Q: Are there any special concessions that will need to be made for tournament and or competitive play? A: Not at all. I assume that all the players have a copy of Patrol Angis and along with that a working knowledge of the rules mechanics as that will hopefully ensure a level playing field when the fun begins. Follow the force creation rules and platoon / lance content along with armour, weapons and skills then it becomes tactical as you can choose the 'Troop Elements' in which your force is assembled on the table. Beyond this tournament games are just like they are at home or at the local club. Q: I am stoked up now for this game! 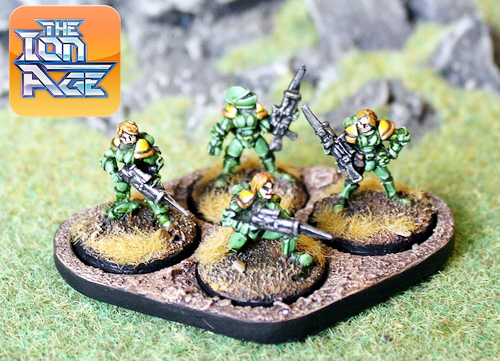 What does The Ion Age have coming that wargamers can look forward to? A: Heck you know I can't give away all the secrets! I can tell you what is coming later on this season and that is more troops for Patrol Angis including a Desteria Knight Command pack and a Desteria Knight Lance with unique miniature. Later on we will be adding new lines to the website and expanding our vehicle pool with a number of new resin kits including the SuperBlue Adder which was previewed earlier in the summer. There is also the follow up to Patrol Angis which is titled 'Callsign Taranis' which is an expansion to add vehicles of all sizes and also structures to go with with our excellent terrain range to the game. This expansion is optional so you can move up from skirmishing if you wish or not. We will also be adding our first non-humans and also a new faction of humanity as well. We have done well and with the aid of no crowd funding or commitments we have walked our own path and it means we have potential now to become one of the largest ranges of 15mm science fiction that there is. Lastly unlike ANY other miniature company out there you get two big bonuses being an 'IonFan'. Firstly when you sign up while ordering your account earns 'Reward Points' which you can save up and exchange for discounts and other items for free! 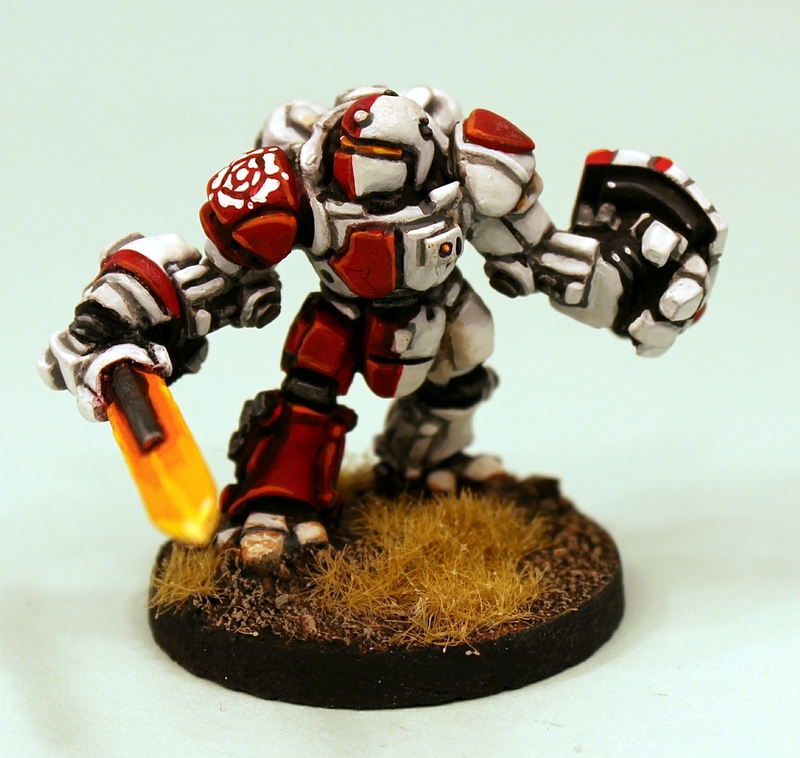 Secondly we have a monthly free miniature which is put in every order for nothing. Now...that is space opera, that is wargaming and that is old school fun and value! Q: Thank you for taking the time to answer these questions from a humble organiser of a local gaming convention. 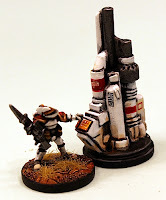 Come to Planetfall 2015 if you are in Indiana! Aris. A: My pleasure and thank you for all the kind words you have spoken over Patrol Angis, The Ion Age and about me as well. I wish you the best of fortune for the convention and who know perhaps in 2016 we will sponsor prizes on the day. Gavin Syme GBS. Oh Gavin I can fell my resolve not to buy any more rule sets weakening by the minute. A great insight into the game. The prospect of simple 1 hour games seems very appealing. Without trying to press you in to revealing any more than you want to at this stage could you say what the ultimate scope of Callsign Taranis will be? How many troops and vehicles would in cope with in what sort of timescale. Please tell me you, your company or both will be showing up somewhere in the NY/NJ area sir! 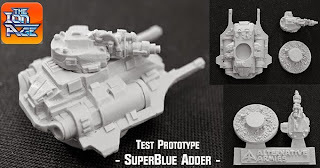 I never know where to ask these things, will the be a conversion bits pack for PM parts like you did with Retained and Muster?